In honor of #NationalIcedTeaDay I thought I would make a post dedicated to the topic. A few years ago I spent an entire Summer/Fall reviewing Iced teas for this blog… and then I became very bored of it. Iced tea may be an American invention, but the focus of this blog is global. Fortunately, as usual, Japan has perfected what we started. In order to compare apples to apples (which I admit I’m usually pretty bad at), I’ve chosen three bottled Houjichas from the three biggest bottled iced tea producers in Japan: Sangaria, Suntory and Itoen. Although they’re fairly obscure in the States, in Japan these can be bought for a 100 yen coin from a vending machine on any street corner (big city or otherwise). Why Houjicha? I haven’t reviewed any in a long time and they are very good. A Tale of Three Hojichas ~ bottles by Jocilyn Mors is licensed under a Creative Commons Attribution-NonCommercial-ShareAlike 4.0 International License. 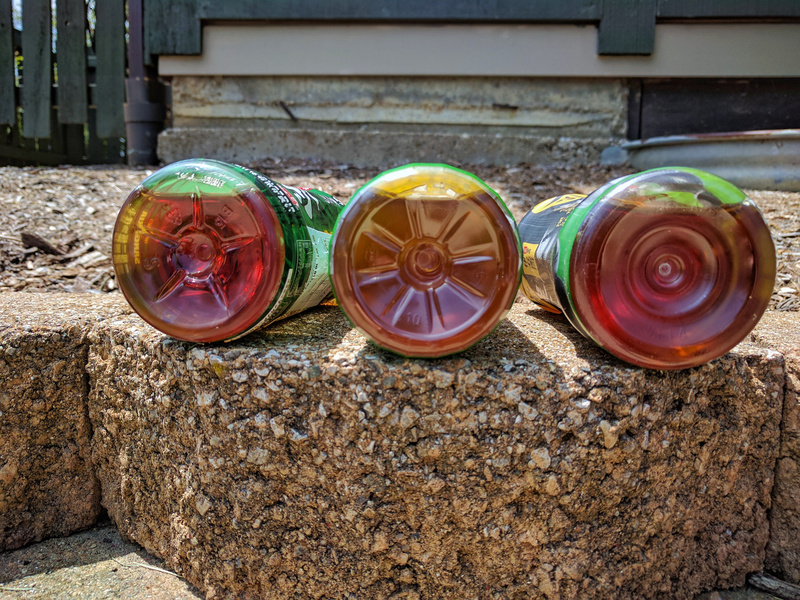 A Tale of Three Hojichas ~ in bottle liquors by Jocilyn Mors is licensed under a Creative Commons Attribution-NonCommercial-ShareAlike 4.0 International License. Sangaria (est. Showa 26)’s Anata no Koi Ocha (「あなたの濃いお茶」 “Your Strong Green tea”) is a deep barky Houjicha, reminiscent of a Sheng. In aroma it actually smells quite a bit like a Chinese market: fresh juniper and ginseng. In flavor a rich syrupy well-roasted Green with hints of aloe. In texture, a full tea grit. It’s liquor is a gorgeous burnished amber. Anata no Koi Ocha (Sangaria) ~ liquor by Jocilyn Mors is licensed under a Creative Commons Attribution-NonCommercial-ShareAlike 4.0 International License. Compared to Sangaria’s Houjicha, Suntory (est. Meiji 32)’s is a bit stronger. Suntory is one of those companies that likes to transliterate in a non-standard Hepburn way to cultivate some kind of aesthetic, and thus uses “ye” instead of “e” in this case. Suntory’s Iyemon Koime「伊右衛門濃いめ」, translated literally as “dense”, has a more Japanese aroma: it conjures up a deep pine grove near a mountain spring. In flavor Iyemon Koi is, well bitter. I’d say it’s by far the deepest roast of the three. If you’re a coffee drinker, you would enjoy Iyemon Koi as an iced tea. Interestingly, considering how roasted and bitter it is, Iyemon Koi has a medium tea grit and spits very well. It’s liquor is a lovely deep amber. Iyemon Koime (Suntory) ~ liquor by Jocilyn Mors is licensed under a Creative Commons Attribution-NonCommercial-ShareAlike 4.0 International License. In stark contrast to the previous two, Itoen (est. Showa 34)’s (rather amusingly titled) Oi Ocha Zokkon 「お〜いお茶ぞっこん」(Hey! Green Tea: Madly in Love) is a quite a bit sweeter and more refined. No pine or juniper here; in aroma, an orchid nursery at dusk. Flavor-wise, Oi Ocha Zokkon is a cane sugary cauliflower with a slightly roasted aftertaste. I was very impressed. It has a medium-low grit. Oi Ocha Zokkon’s liquor is a brownish yellow, more Houjicha-like in coloration than the other two. Oi Ocha Zokkon (Itoen) ~ liquor by Jocilyn Mors is licensed under a Creative Commons Attribution-NonCommercial-ShareAlike 4.0 International License. It’s a very close race: they all round up to a 94, though Itoen’s Oi Ocha Zokkon is technically the highest rated (and the one I personally liked the most). In terms of taste, they’re all quite flavorful in their own way. Refreshing and unique, Japanese bottled Houjicha is an experience not to be missed.